Today is a school day. It is suppose to be a replacement day for the extended holiday the school will be taking for the Deepavali celebration in October. Schooling on a Saturday is not a good idea as proven by the poor attendance of students today. There's only 4 girls present in 5KA and only a handful in my 4SA class today. Merit marks were given to all students who were present today. My 4SA class was taken over by the physics teacher. The students needs more help in Physics than in Math. As for my 5KA class, I continued with the Earth As A Sphere chapter. Lesson was a breeze today compared with the regular days where I have to handle 23 boisterous girls who doesn't know the meaning of quiet. Its sure is a challenge teaching these girls but I enjoy every minute of it. Today we tried some problems on determining the location of places on the earth's surface. Any location on Earth is described by two numbers--its latitude and its longitude. If a pilot or a ship's captain wants to specify position on a map, these are the "coordinates" they would use. Actually, these are two angles, measured in degrees, "minutes of arc" and "seconds of arc." These are denoted by the symbols ( °, ', " ) e.g. 35° 43' 9" means an angle of 35 degrees, 43 minutes and 9 seconds (do not confuse this with the notation (', ") for feet and inches!). A degree contains 60 minutes of arc and a minute contains 60 seconds of arc--and you may omit the words "of arc" where the context makes it absolutely clear that these are not units of time. To determine the latitude of a location, imagine that the Earth is a transparent sphere (actually the shape is slightly oval; because of the Earth's rotation, its equator bulges out a little). Through the transparent Earth (drawing) we can see its equatorial plane, and its middle the point is O, the center of the Earth. To specify the latitude of some point P on the surface, draw the radius OP to that point. 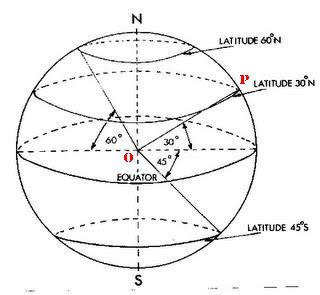 Then the elevation angle of that point above the equator is its latitude λ--northern latitude if north of the equator, southern (or negative) latitude if south of it. In the diagram below, the latitude of P is 30°N. Longitude is distance east or west of a base line called greenwich meridian or prime meridian. The longitude of any given place is its distance, measured in degrees of arc, from this base line.